Incremental has been working with Microsoft Dynamics for over 20 years. Our team of specialist Dynamics consultants is certified by Microsoft and has worked on hundreds of Microsoft Dynamics deployments. Incremental Group is a Microsoft Gold CRM and ERP partner as a result of our track record and expertise across the whole range of Microsoft Dynamics. We help organisations get more value from their current system and upgrade to Dynamics 365.
keep your system performing to the standards you need by providing you with a scalable and secure infrastructure. limit unnecessary customisations to ensure easy and affordable upgrades are available when required. provide training and support to ensure user adoption and continuous improvement across your organisation. 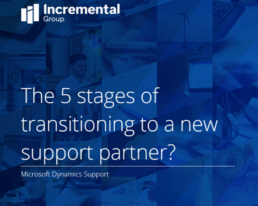 Incremental Group works with organisations currently using Dynamics AX, NAV, GP and CRM to assess the risk to their business of remaining on a legacy on-premise solution and the business benefits to be derived from upgrading to Dynamics 365. This involves one of our experienced Dynamics Consultants conducting an Upgrade Readiness Assessment (taking into account customisations and 3rd party modules), highlighting the risks and opportunities for businesses and demonstrating later versions to showcase what benefits can be delivered. Finally, Incremental Group will objectively prepare a report with a recommendation on the best option for the organisation with an implementation plan to allow thorough consideration of the next steps. Dynamics AX is a Tier 1 ERP solution that provides a wealth of core functionality for the Enterprise. Dynamics AX is no longer available to new customers and is being replaced with Dynamics 365 for Finance and Operations. 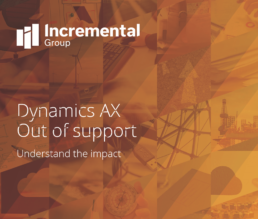 Dynamics AX 2009, 2012 R2 and 2012 RTM went out of support in October 2018. Dynamics CRM was historically Microsoft’s lead CRM solution. It has now been replaced by Dynamics 365 Customer Engagement. If your business is running Dynamics CRM, it might be time for an upgrade. Dynamics CRM 2011 and 2013 are now out of mainstream support. As of 1st April 2019, Dynamics NAV is no longer available to new customers. It has been replaced by Dynamics 365 Business Central. 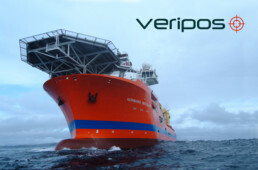 Discover our range of support and upgrade services available for Dynamics NAV. Microsoft Dynamics GP (formerly Great Plains) is a complete enterprise resource planning (ERP) solution for small and medium sized businesses looking for something that is easy and quick to implement. It helps you gain greater control over your financials, inventory and operations. 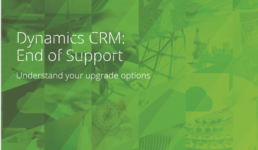 Discover our range of support and upgrade services available for Dynamics GP.